Clomicalm is to be used as part of a comprehensive behavioral management program to treat separation anxiety in dogs greater than 6 months of age. Inappropriate barking or destructive behavior, as well as inappropriate elimination (urination or defecation) may be alleviated by the use of Clomicalm in conjunction with behavior modification. Professional judgment should be used in monitoring the patient's clinical status, response to therapy and tolerance to side effects to determine the need to continue treatment with CLOMICALM Tablets and to continue to rule-out physiological disorders which may complicate the diagnosis and treatment of separation anxiety. Diagnosis: It is critical to conduct a comprehensive physical examination, including appropriate laboratory tests, and to obtain a thorough history and assessment of the patient's household environment, to rule-out causes of inappropriate behavior unrelated to separation anxiety before prescribing CLOMICALM Tablets. Periodic reassessment of hematological and serum biochemical data during the administration of this medication is advised. Veterinarians should be familiar with the risks and benefits of the treatment of behavioral disorders in dogs before initiating therapy. Inappropriate use of CLOMICALM Tablets, i.e., in the absence of a diagnosis or without concurrent behavioral modification, may expose the animal to unnecessary adverse effects and may not provide any lasting benefit of therapy. Drug Interactions: Recommendations on the interaction between clomipramine and other medications are extrapolated from data generated in humans. Plasma concentrations of clomipramine have been reported to be increased by the concomitant administration of phenobarbital. Plasma levels of closely related tricyclic antidepressants have been reported to be increased by the concomitant administration of hepatic enzyme inhibitors (e.g., cimetidine, fluoxetine). Plasma levels of closely related tricyclic antidepressants have been reported to be decreased by the concomitant administration of hepatic enzyme inducers (e.g., barbiturates, phenytoin). Caution is advised in using clomipramine with anticholinergic or sympathomimetic drugs or with other CNS-active drugs, including general anesthetics and neuroleptics. Prior to elective surgery with general anesthetics, clomipramine should be discontinued for as long as clinically feasible. It is important that your dog be closely monitored by your veterinarian while on a treatment plan with CLOMICALM Tablets and behavior training. You must inform your veterinarian of any current or future medications you are administering to your dog. The use of CLOMICALM Tablets in conjunction with certain other drugs or when your dog has other illnesses may be contraindicated or increase the risks of adverse reactions. It is important that you inform your veterinarian of any changes in your dog's environment including, but not limited to, a new family member, a new pet, a move to a new location, or a change in your existing daily schedule. Some changes may result in an altered response to therapy. It is important to inform your veterinarian of any perceived changes in your dog's behavior, appetite, or overall health while administering any medication. Some dogs display a temporary lethargy with the first few days of CLOMICALM treatment. In some cases, signs of separation anxiety, such as vocalization, may temporarily increase at the initiation of treatment. In an overdose situation, seek veterinary attention for your pet as soon as possible. The safety and efficacy of CLOMICALM Tablets have not been established in dogs less than 6 months of age or in pregnant or lactating female dogs. CLOMICALM Tablets should not be used in breeding male dogs (see Contraindications). 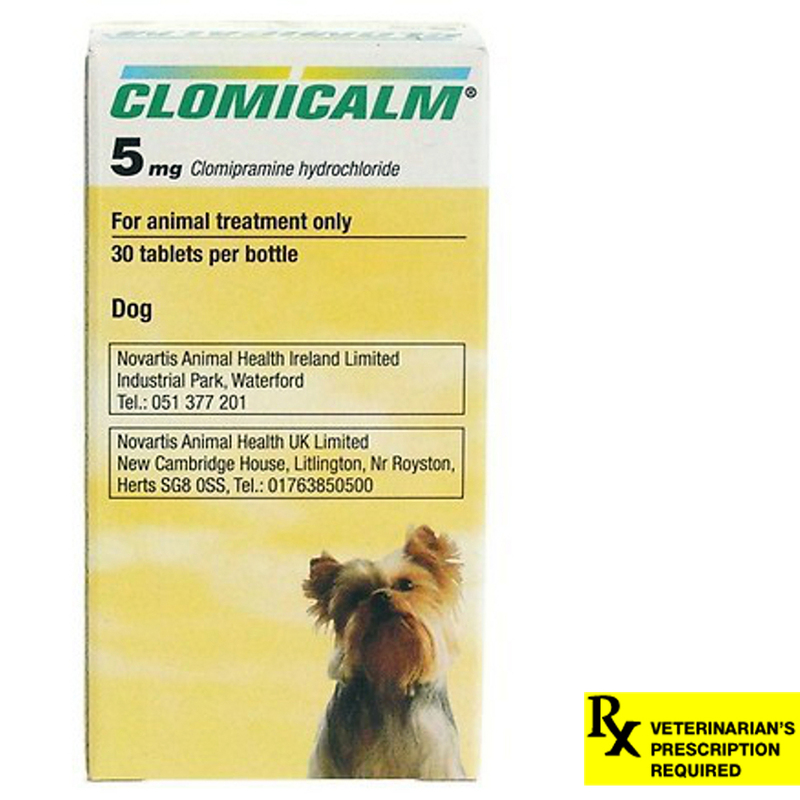 CLOMICALM Tablets are not recommended for other behavior problems, such as aggression.